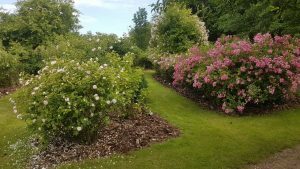 A FAIRYTALE OF ROSES’ – Pre-CONVENTION TOUR – July 2018. On the 21st June 2018, my husband and I had the great privilege, together with 20 other South Africans to attend the World Rose Convention in Denmark. There was a pre and post tour option offered before and after the rose conference. We jumped at this ‘once in a life time’ opportunity. The tours certainly exceeded our highest expectations. As we experienced and saw so much during this week, I can only touch on some of the highlights for this article. On the 22nd June, we left Copenhagen for Torben Thim’s nursery located on Løve Mark. The nursery was founded in 1930 by Valdemar Pedersen. Torben Thim took over the nursery in 1979 and has since developed and refined this unique collection of roses. 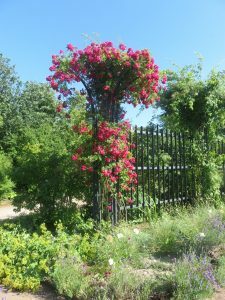 Thim’s nursery is truly worth a visit and not only for the roses but the entire, park-like grounds. We spent the morning enjoying Thim’s vast knowledge of plants and roses. After lunch we headed for the small island of Als, where we visited Hyldebjerggård – a truly magnificent garden. Ejnar Jorgensen, the owner is meticulous with no shortage of attention to detail. Walking around this garden was a totally mesmerizing experience. 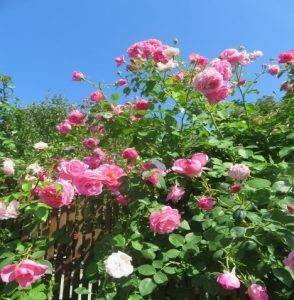 All the roses were in full bloom – combinations of Hybrid Tea’s, Old Garden Roses, modern roses and climbers. This garden has 775 roses of 440 different varieties. It was here that I realised how important heritage roses are and how they complement all the other roses. 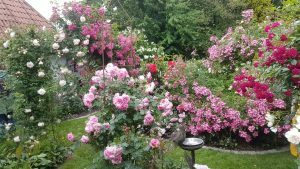 It was amazing to see how Mr Jorgensen, in his small garden, with careful planning, had incorporated so much, especially the old roses on the outskirts. It was truly a memorable visit. This was the first day of many beautiful outings. small lakes and streams. 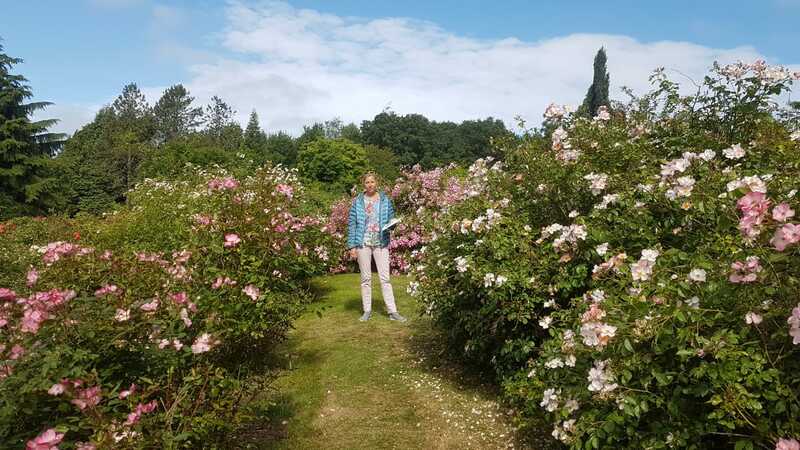 Today she has over 700 old garden roses, ramblers, climbers, David Austin and other modern roses in all scents and colours. Here I noticed how she had grown old roses into old pear and apple trees giving a most striking visual effect. identification easy as many of the rose bushes had finished blooming. The number of different varieties was mind-boggling. I cannot describe how marvelous this tour was. 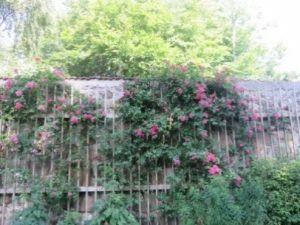 I learnt so much, especially about old roses and how to incorporate them into garden design. To top it all, the weather was unbelievable – very unusual and according to the Danes, the best summer in 100 years!